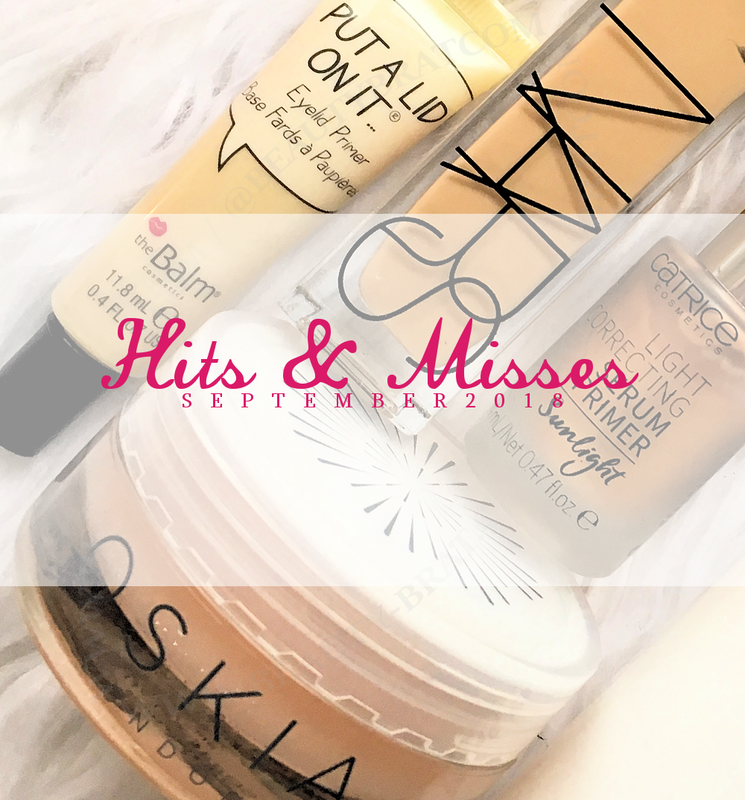 It’s time for my September Hits & Misses. It only feels like yesterday that I wrote my August Hits & Misses. I don’t have a huge amount of items this month, but that’s because a lot of what I was loving from last month (see my August H&M here) I’ve been loving and using again this month. Each month I try to switch up my products just so I get through them all and each monthly round up isn’t the same, but some months that doesn’t happen for one reason or another, and this is one of those months. Nonetheless, I hope you enjoy reading. As always, I will start with my favourites and then move onto my misses. J. Lo X Inglot Eyeshadows– I’ve rediscovered these eyeshadows this month and have been loving them, in particular, the shade Crimson, which is a deep, rich burgundy colour. Full review here. I adore colours like this especially for this time of the year. Warm tones are my favourite and this colour is right up there with my top favourites. Smooth, creamy, buttery, pigmented, longwearing, inexpensive and no creasing. Could you ask for any more in an eyeshadow? You can purchase this shadow from Inglot.ie. The only thing with these shadows is that they benefit from an eye primer, as it will help them to be more pigmented. Marc Jacobs Velvet Noir Major Volume Mascara – I started using this mascara earlier this month after I read this post on Beautylymin. I have a full review on this mascara here. This mascara is one I had heard a lot about, everyone seemed to love it, but being €20+ I wasn’t willing to splash out without trying a sample or travel size first. I did a haul back in July (see post here) and a couple of sets I got included it so finally I was able to try it, and so far, I love it. I will admit – I am pretty hard on mascaras. I expect a lot from them and it’s rare that a mascara ticks every box for me. This mascara however has very quickly found its way into my top favourites. It’s such a gorgeous texture and it’s light so my lashes aren’t weighed down. It’s long wearing with no flaking or smudging and it gives my lashes separation, definition, volume and length. It is also extremely black, which is a must for me when it comes to mascaras. At first, I thought the wand would be tricky as it is quite ‘long’ and often I struggle with long wands, but not with this. Despite being long it is mess-free, easy to coat each and every lash without having blobs of mascara on my inner and outer corners, which often happens. Very few mascaras tick all of those boxes. A winner for me and you can be sure I will be repurchasing the full-size. It is one of the best mascaras I’ve discovered. NARS Radiant Longwear Foundation – Another summer discovery for me. Despite NARS foundations being cult favourites, I had never tried them until this year when I purchased both Sheer Glow and this, their Radiant Longwear Foundation. I adore both, but this month their Radiant Longwear Foundation is what I have been reaching for mostly. It’s a beautiful creamy full coverage foundation, but it can be sheered out to give medium coverage. It’s exactly as the name suggests – radiant and longwearing – two things I look for in foundations. This blends out beautifully, evenly and gives my skin a gorgeous glow that doesn’t lessen when I use setting powder. I’ve worn this on really long days and it has held up without issue. Catrice Priming Serum in Sunlight – I have this in Candlelight and I adore it, so when I heard Carly from Live-Lavishly mention this one on her Instagram stories I immediately went on the hunt for it. I found it after a few weeks and have been using it constantly since and I’m in love! It’s a beautiful golden colour that looks gorgeous on its own just buffed into the skin for a healthy, radiant glow. It works well mixed into foundations (especially matte foundations) to help take away any flatness and add some radiance and it also works well under foundation. My preference is to mix it with my foundation or wear it alone. It doesn’t effect the application, wear time or performance of my foundation, it just adds a radiance to it. Oskia Renaissance Mask – If you follow me on Instagram you’ll know that Oskia is one of my favourite skincare brands. Every product (bar one, which is this months miss) I’ve tried from them I’ve loved – this mask is no different. I got it in July’s edition of Mintd Box and have been using it since mid-August and it’s quickly become a firm favourite. It’s absolutely gorgeous. It’s described as a plumping and brightening mask – and it definitely does both of those. It also adds a glow to my skin. When I use this my skin feels amazing after, as well as look bright, radiant, health and having a glow. There is something about this mask that it just works wonderfully for my skin. When I want to give my skin a boost I use this mask because I know I can rely on it to give my skin the boost it needs. If you haven’t tried this, you are really missing out. Oskia Renaissance Cleansing Gel – Another favourite of mine. I adore this and so does my skin. This is such a gentle but effective cleanser that leaves my skin feeling soft, clean and looking radiant. It’s great for removing makeup too and doesn’t sting or cause any irritation to my eyes or eye area which is a big plus for me. I love mixing some of Oskia’s Micro Exfoliating Balm (full review here) with this to gently exfoliate my skin – they work amazing together. My skin looks and feels great after too. None of Oskia’s products strip my skin or leave it feeling tight, uncomfortable or cause further dryness. My first miss this month is by Oskia. I love every Oskia product I have tried – except for this. This is the only product I have tried from them. It pains me to say that I dislike a product from Oskia. It is their Cupid’s Bow Lip Balm. I suffer with shocking dry lips that need serious hydration and I had hoped that this balm would be the answer, alas, it wasn’t. I thought this would be a nice lip balm with a lovely consistency, however, it’s not, for me at least. In the pot it is solid but once you start applying it to your lips it changes to a very thin consistency that feels quite slippy, similar to Vaseline. It also feels gritty, which I’m assuming is because of the shimmer in it. I haven’t found it to add any colour to my lips and definitely not a pink colour. It’s transparent, slippy and gritty. Not nice at all. This is prohibitively expensive at £28 / €31.50. I got mine on sale but even then it was expensive for a lip balm. I’m very disappointed as I usually love Oskia’s products but this is a fail. An expensive fail. My next two misses are both eye primers. They are The Balm’s Put A Lid On It Eyelid Primer and Too Faced’s Shadow Insurance. The only reason these are both misses for me is because they don’t help my eyeshadows apply, blend, look or last better than without any primer. NARS Pro Prime eye base and MAC’s Painterly are the only ones that help my eyeshadows with application, longevity, blending, etc. They are not bad products by any means, they just don’t work for me personally.